Make a small investment in your heritage and become a member today. We can't wait to see you at our next stemne August 15-17, 2019, in Lanesboro, MN. Info and registration here. Let us help you find your roots. Visit our Genealogy pages to learn how to get started, to expand your current research or share your ancestry with others. What is a lag? Persons who are generally interested in the culture and heritage of Norway will likely become a member of the Sons of Norway, as approximately 110,000 persons have done. They, however, focus on the whole nation of Norway. “Lags”, or bygdelags, concentrate on specific areas of Norway. At present there are about 27 active “lags” which represent specific geographical areas. 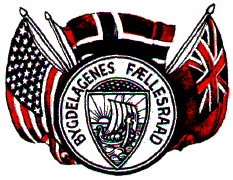 All in organization under the Bygdelagenes Fellesraad. Oftentimes, an area developed their own language dialect, culture and traditions (such as folk dances, dress and rosemaling patterns) which were different from every other area of the country. Lags strive to maintain and celebrate these regional differences.